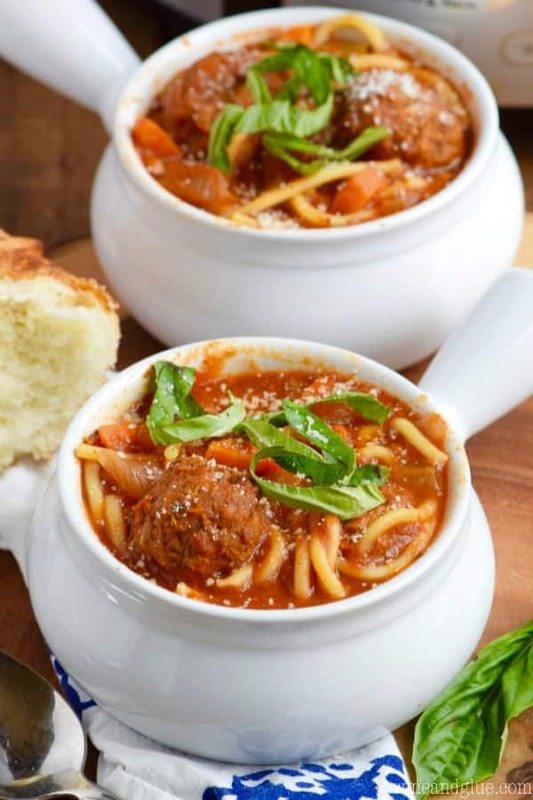 This Slow Cooker Spaghetti and Meatball Soup is easy to throw together, totally hearty, and ultimate comfort food waiting for you when you get home. I’m so proud to be partnering with Jennie-O to bring you this amazingly delicious dinner. Thank you for supporting the brands that make Wine & Glue possible. I did one of my very least favorite chores over the weekend . . . the changing out of the seasonal clothes. Which is probably a good thing, seeing as how I picked up the kids from school last week one day and I was shivering . . . in jeans and a sweater . . . and I had sent them to school in shorts and t-shirts! Oh, cruel Wisconsin, you fickle beast. Seriously, we very often in the fall go from ridiculously hot to super cold overnight. And leave it to me to be the mom who is not on top of things and sends their kids to school in super weather inappropriate clothing. Doh! So now the kids have jeans in their drawers, and sweaters on their shelves and we are ready to roll. Which of course means it will be in the high 70s this week. Grrrr! But, cold weather is for sure coming, and I must say that after game day foods, one of my favorite recipes to develop is comforting slow cooker dinners. They are perfect for busy weeknights, because #slowcooker, and they are perfect for the cooler days of fall because they are the kinds of meals that warm you from the inside out. I’m super pumped about this particular meal because it is a soup, which is awesome, but it is also not a soup! Because I swear if you let it sit in your slow cooker just one extra half hour, it suddenly becomes just straight up spaghetti and meatballs, which is kind of awesome when you have kids like mine who look at the liquid in a soup bowl and then look at me like I have four heads. So you can really go either way with this one. And! It is really pretty good for your kiddos. It has a ton of veggies in it and is made with lean Jennie-O ground turkey for the meatballs. And I know that some people shy away from turkey, being worried that it will be too dry, but it’s really not! I use Jennie-O turkey all the time to make my meatballs and they always turn out awesome. And in this really hearty soup, they are even more amazing. Plus!! You can cook this guy (pre putting in the noodles) for like an extra hour or two and it totally will not dry out your meat. The flavors are so rich and delicious. Your family is going to love this one. 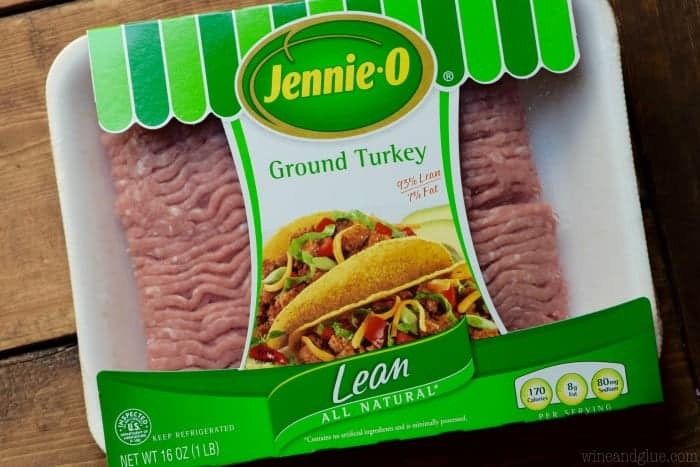 For more great dinners using Jennie-O, click HERE, and be sure to follow Jennie-O on Facebook, Instagram, Twitter, and Pinterest! Add the carrots, onion, celery, garlic, salt, pepper, tomato sauce, crushed tomatoes, and chicken broth to the crock pot. In a large bowl, combine the Jennie-O ground turkey, bread crumbs, parmesan cheese, egg, parsley, basil, and garlic salt. Using a 1 1/2 TBSP scooper (or you can just eye ball it), make your meatballs, rolling them and then tossing them into the crock pot as you go. Before starting up your crock pot, make sure they are entirely covered by liquid. This soup is not only gorgeous but I want it!! my super picky husband will love this!! pinned! This looks like pure comfort! The whole family would love your soup! This is fantastic! Will definitely be trying it out this fall/winter!! I’d love a big bowl of this soup right now! My kiddos will go crazy for it too! Ok, I’m glad I am not the only one who detests changing out the clothes! I wait as long as possible because I have changed them out only to be back in the mid 80’s, ugh! 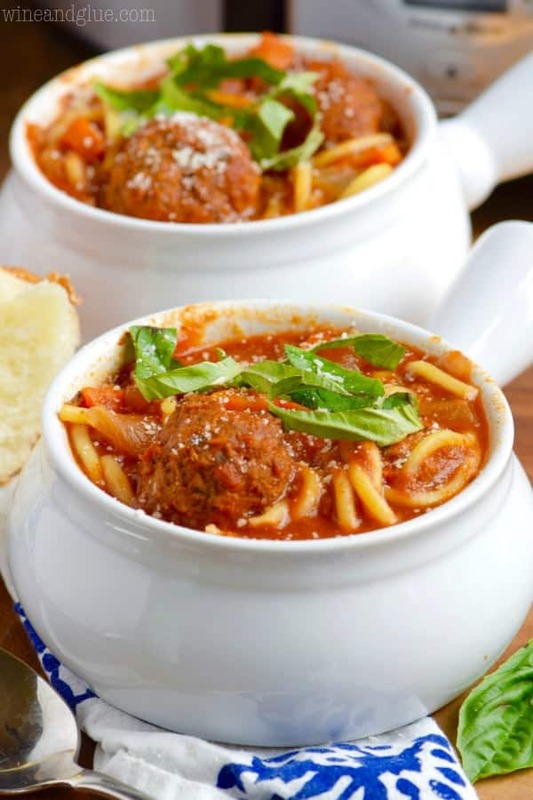 This soup has to happen in our house this fall, my kids favorite meal is spaghetti and making it in the crock pot makes it that much better!! So much better!! I love that the rush of dinner time isn’t so busy with this meal. I have never tried adding pasta to a soup (or non-soup) in the slow cooker. This is happening ASAP! 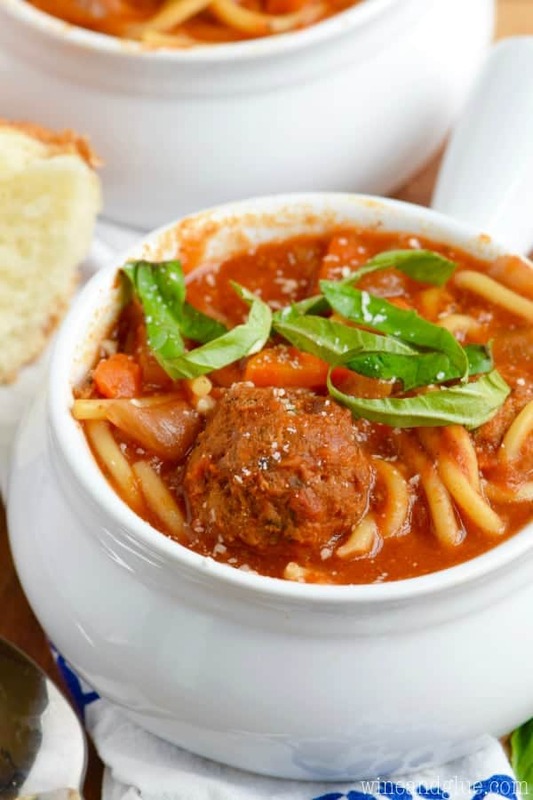 This looks like perfect comfort food for chilly days! I love that it can be a runny soup or thicker pasta stew!! !